Remember when everyone had, or desperately wanted, a home page (including my mother)? Then came Webcams. (You're right, there probably was another fad before Webcams; let me know if you remember what it was.) Then everyone began blogging. The current rages are podcasting and, to a much a lesser extent, screencasting. I'm going give you a quick walkthrough of podcasting and a taste of screencasting, enough so you'll be able to use the words at your next backyard barbecue without embarrassing yourself. When I first heard about podcasts, I thought I needed to have an Apple IPod to listen to them. That's nonsense: Podcasts are nothing more than MP3 files that you play on your computer with Windows Media Player, or any other software audio player. If you want portability, you can copy a podcast to your MP3 player. The content of podcasting ranges in quality. On one hand, the same dude who blasted his lame, one-page home page at you, and then started blogging some inane chatter, has moved on to podcasting. ("Hey dudes and dudettes, comin' at ya from Dudesville, this is SuperDude with all the dude news.") Thanks, dude; I'll pass. On the other, lots of first-rate people (me included in about a month) and radio stations are creating podcasts. And many of these are worth the listen. For instance, I've used Audible.com for eons and even pay $50 a year to download a licensed copy of NPR's Science Friday. I can listen to it on a variety of MP3 players, but the file's format is proprietary and I need an Audible.com subscription to access it. But guess what? Science Friday is now offering free podcasts. My other favorite radio show (and one I recommend), Terry Gross's Fresh Air, runs $40 a year on Audible.com. But the NPR site streams Fresh Air for free, and NPR is very close to offering podcasts. It gets better. NPR has a listing of free shows and local stations that offer podcasts. IMHO, the best of the bunch is KCRW, with Good Food and Harry Shearer's le Show. Another directory with an incredible mix of podcasts is, well, the Podcast Directory. Browse the site and you'll find Cruise Control, a talk show on cars; Air America Radio's Randy Rhodes Show; and This Week in Tech. Dig This: Next time you complain about Windows crashing or threaten to switch to Linux, consider what computing life was like in the 1970s. You need an aggregator (yeah I know, it sounds like a garden tool) to make it easier to find, download, organize, and ultimately send to your MP3 player the podcasts you've subscribed to. The one I use--because it's mercifully easy to use and a freebie--is IPodder. Unfortunately, it'll still take you 20 minutes to understand how to use it. If IPodder's not your cup of tea, read Tom Spring's "Podcasts Go Mainstream" for more suggestions. You might be ready to abandon working on your home page redesign and try your hand at creating a podcast. Read Dan Tynan's "Radio Blogs?" for a better idea of how to podcast and what tools and applications you'll need. Oh, and do let me know when it's ready. And if you have a blog and want to podcast it, try Talkr, a Web-based tool. (No, you needn't let me know when your blog feed is ready, thanks.) Talkr also lets you listen to blogs on your IPod. I have one more option for you: SkypeCasting. That's right, you can use Skype to create "great sounding audio recordings from interviews and conference calls" without, as the site proudly claims, "resorting to studios, or fancy gear." It's worth a look, especially if you don't have either a studio or fancy gear. BTW, if you want that fancy gear, take a look at the $2850 WorldVibrations Radio Station, a broadcasting, streaming, and podcasting appliance. Dig This: Here's something to ponder. 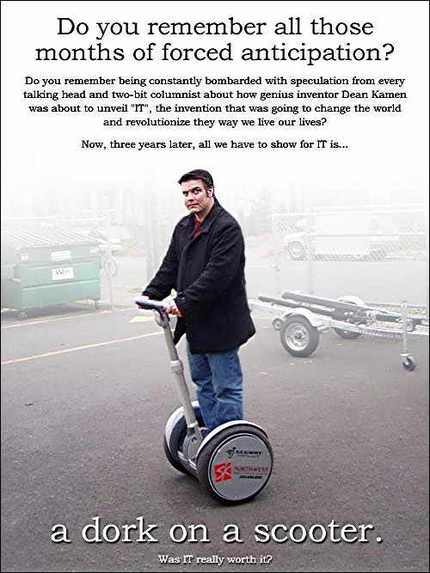 Whatever happened to those Segway scooters? A screencast is a series of real-time screen captures that are saved as a video. Good screencasts have an audio track; some even have a small box with a head shot of the narrator. So imagine watching a video of me showing you how I use Maxthon to navigate through the Internet and listening to me explain what I'm doing. You can see what that might be like by watching a screencast by Harry McCracken, PC World's editor in chief. But the master of screencasts is InfoWorld's Jon Udell. For an example of his handiwork, view this short screencast that explains how to use a password generator (click on "Today's 2.75-minute screencast"). Another good one is his Google Map screencast tour. To see and hear more on screencasting, including more screencasts, head for Jon Udell's February 21, 2005 blog entry; also take a look at his screencast page. More than one editor has suggested I do a couple of screencasts--and I will, I promise. You'll be the first to hear about it. The program I'm experimenting with is TechSmith's Camtasia Studio, IMHO, the premier screencasting tool. At $300 it's certainly not cheap, and it costs $448 with a high-quality lapel microphone and Logitech camera. Camtasia's a powerful package and a little overwhelming at the start. But after a half-dozen experiments with the editing and timeline tools, I've been able to create a decent screencast with narration, a couple of transitions, plus a picture in a picture of me. TechSmith has a sample Camtasia video (it's an ad, but it shows lots about the product), and it offers a 30-day free trial. Dig This: I get 404 errors all the time as I browse the Web; here's one that tickled me with its irreverent tone. Steve Bass writes the "Hassle-Free PC" column in PC World's print edition and is the author of PC Annoyances, 2nd Edition: How to Fix the Most Annoying Things About Your Personal Computer, available from O'Reilly. Sign up to have Steve Bass's Tips & Tweaks newsletter e-mailed to you each week. Comments or questions? Send Steve e-mail.